Most dance movies can be categorized in one of two ways: the non-fiction documentary or the fictional major motion picture. The former seeks to share actual events through historical footage and interviews while the latter is a made-up story in which dance is prominently featured. Both types have their niche, yet both also have their problems. Dance documentaries can be incredibly fascinating, revealing and educational, but they generally don’t enjoy a very wide audience (and viewership definitely matters). The wider release fictional movies often end up combining good acting with bad dancing, or great dancing with horrible acting. If an actor is cast in a dancing role, then the director has two choices. Try and teach them or use the very obvious dance double. Both options are just not good. Casting professional dancers in lead roles is also not a solution because more often than not, they must be taught how to act (and this attempt can be unsuccessful). There are a few exceptions to this (in my opinion, at least): “The Turning Point”, “Dirty Dancing” and “The Company”. These three managed to overcome the obstacles, and featured wonderful dancing coupled with fabulous acting. Still a third format exists where true events are adapted into a screenplay. Though not as common with dance-based movies, this winning formula produces successful and compelling results. 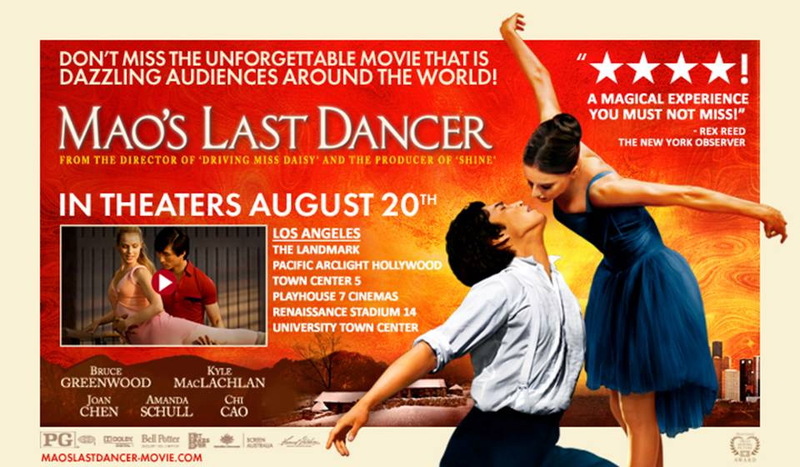 This is exemplified by “Mao’s Last Dancer”, a film that retells the unique journey of ballet dancer Li Cunxin. In two hours, we learn how he was selected from a rural village in China to compete for a spot at Beijing’s national ballet school, his acceptance into that academy, how he spent his youth and adolescence training for a professional career at this rigorous institution, the separation from his family during these formative years, his voyage to the States for a summer intensive, how he found love, became a star, made the difficult decision to stay in America, fought to make that happen and how he endured the consequences of that choice. At each point, the audience is keenly aware of three desires: Cunxin’s longing for home, his continual search for artistic meaning, and his pursuit of freedom. Throughout his life, these yearnings were often at odds with each other. 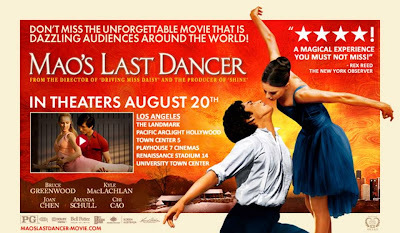 However, by the end of the movie, Cunxin has experienced the joy of an existence where all three were finally realized. Birmingham Royal Ballet’s Chi Cao was absolutely superb in the title role; a combination of solid acting and transcendent dance. One scene particularly stood out. After years of not being permitted to see or communicate with his parents, Li is reunited with them toward the end of the film. This moment was so raw - Cao was pure emotion as he dropped to his knees in tears. All of his dancing was extraordinary, but specifically the Act III variation and pas de deux from Don Quixote. The way in which the cinematography captured Cao’s technique was stirring; the audience in the movie theater applauded like they were watching him live on stage. That’s how genuine, authentic and transformative “Mao’s Last Dancer” is. Two members of the supporting cast also deserve particular mention. Madeleine Eastoe (as Lori) was delightful, both in the dramatic portions and in her few instances of comic relief. The excerpts of Eastoe and Cao in “Swan Lake” were teasing to any ballet fan. I immediately wanted to see more of them in this particular version of the full-length classic. Amanda Schull (as Liz) has really come into her own as an actor. A decade has passed since her first foray into film (“Center Stage”), and she has certainly used this time to improve her acting. The scene in Liz’s apartment where she watches Li dancing on television was fabulous. Schull had no lines here, but her face spoke volumes. She is no longer just ‘a dancer who acts’; she is an actor. Having said that, I will admit that I missed seeing her dance in this movie. Now that her acting and ballet skills are on par with each other, it would have been nice to see the latter utilized.